bird number 2 fell at 3:25 pm today. another public land bird. he has been quite the adversary. been after him since the second day of our season. he would hammer most every day on the limb but once fly down he would shut up. he had and has had hens every day. I have seen him 3 or 4 times from a distance and been within 100 yards of him on the ground and in the roost but he would not respond to calls. I told my buddies that the only way that bird would die is once the season opened to all day hunting and I caught him in the fields. well today was that day. following is the story of the demise of, well I really can not put the name I have been calling him. I went with a buddy off the roost. we heard one bird way off and he did not want to go after him. so by 6:30 we was headed back to his house. well I was not done. so I went to the public I call my honey hole (has not been much honey in it this year!) I planned to just sit in a chair and glass the fields. I was only there about 15 minutes when a gobble 5-600 yards away reached my ears. woah. there had not been a bird gobble there all year. so I waited and he kept gobbling. I backed out to the truck to get my gun and gear and to move my truck out by the road so others would see it and hopefully not pull in to one of the other parking spots to hunt. as I was getting ready a truck stopped and chatted about the lack of gobbling. grabbing the rest of my gear off I went. I followed a trail out to the base of the hill he was on and by now he was on the back side so it was perfect. I slipped up the face and up and old logging road. I got within 70 yards of the field he was in and setup on the road. it had been 20 minutes since his last gobble so I was not sure where he was. decoys out and settled in my chair. I let out a light series of clucks and yelps. the responding sound of silence was deafening! so I gave it a few minutes and let a few more. again silence. so I set the call down and waited, and waited, and waited. no gobbles no bird no nothing! so now the thoughts are flowing. did I bump him? no how could I have I was quiet and 150 yards from his last gobble. so after an hour I slipped back down the road and circled the woods to look out in the field. nothing anywhere. so I set up because from there I could see 1000 yards of field across the valley and a huge section on my side. sitting for about 20 minutes and he gobbles. he had went across the valley. so I grab my stuff and move out. cross the valley and ease up to a point of trees on a ridge. a good glassing point. I spot him about 400 yards out. he would half strut and gobble on his own. I knew I had to get closer as they have not been responding to calls. so I move out again. he vanished. I could not figure out what happened. he stopped gobbling and everything. so I went back out the point and set up in the shade to watch. after about an hour he gobbled. I look around a tree and he is out there slowing coming my direction but going to be way out of range. I got to move. so I do and again he is gone. what the heck! I spot a long beard and 3 jakes about 800 yards in the opposite direction. so again I set up to watch. I am watching them and plotting a kill strike. gobble! I turn and see him on the other side of the valley. ugh. ok I wait until he goes behind the hill. the other birds moved into the woods so I rocket out of there like a torpedo. I am worn down but push on the 500 yards to the other woods. he is still gobbling periodically as he wraps the woods in the field. I get on the logging road and get out in front of him. slip down to the field and just as I reach the tree I picked out I look down the field 175 yards. Crap! busted. he doesn't run just rubber necks into the little creek bottom. so back down and across the valley I went. up the other side to the ridge point. slip along until I can see the birds. I watch as he and the hen slips around the point of woods. down the hill and up the next. man I am starting to drag. down again. at the bottom I drop my gear and get chuck(my decoy) out. I give him a pep talk as I put him together. he is ready for battle. so I ease up the hill. slip around the point but there is no birds in sight. so I slip slowly along. finally I spot them in the bottom. he has another hen so 2 hens and him. I hold chuck up high so he can see him. he folds strut and looks, then blows back up. so I advance a little. that did the trick. he folds and is coming quickly. I am still holding chuck and hunkered behind him when he crests the hill at 30 yards. he is running. I jam the stake in the ground and with my right hand pull the hammer down on the encore as I am raising it to my shoulder. he stops at 25 and blows in to strut. BOOM! he hits the ground hard and as I get to him he barely flops a wing. 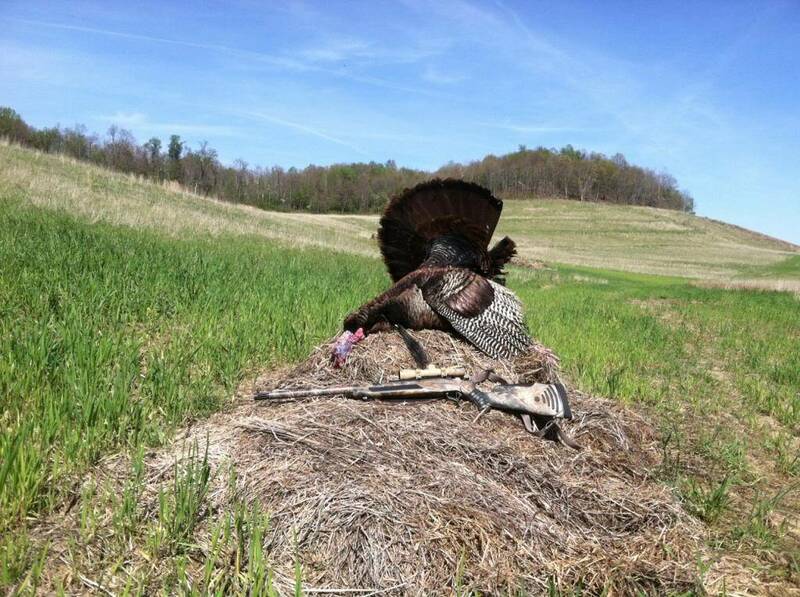 the Winchester longbeard xr #5s hammered him. maybe now that the boss is gone the other birds will be more responsive. 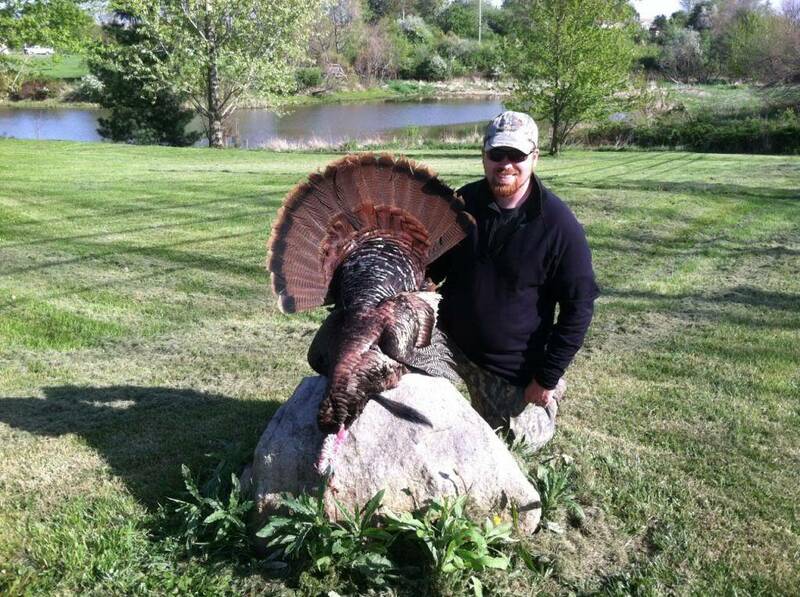 20lb 5oz 10 1/4 inch beard 1 1/4 and 1 5/16 spurs. Sounds like a hard earned bird! Congratulations! Thats a big bird ! Nice bird and you definitely earned him ! Congrats and way to stick with them! I have yet to put even one down !